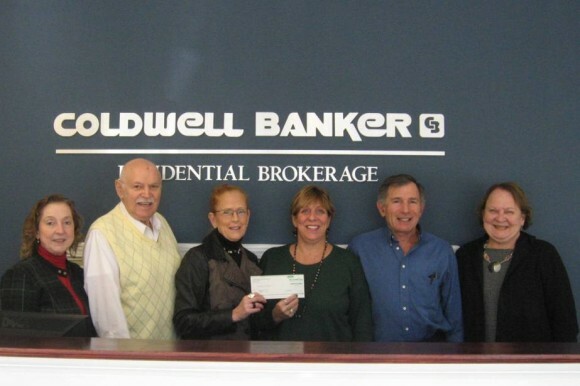 The Coldwell Banker Residential Brokerage Essex office recently presented an $800 donation to the Essex Housing Authority. Pictured from left are affiliated sales associates Dee Hasuly, Roy Monte, Laurel Peters, Tammy Mesite of the Essex Housing Authority, Peter Bonanno, and Jeanne Rutigliano, manager of the Coldwell Banker Essex office. ESSEX – The Coldwell Banker Residential Brokerage office in Essex recently donated a total of $1,800 to the Shoreline Soup Kitchen & Pantries and the Essex Housing Authority. The donations were made through the company’s charitable foundation, Coldwell Banker Residential Brokerage Cares Foundation. A $1,000 donation was presented to the Shoreline Soup Kitchen & Pantries, an interfaith service that provides food and fellowship to those in need and also educates the community about hunger and poverty. Additionally, an $800 donation was made to the Essex Housing Authority. 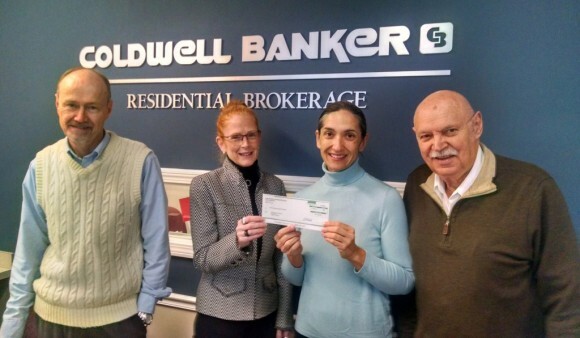 The Coldwell Banker Residential Brokerage Essex office presented $1,000 to the Shoreline Soup Kitchen & Pantries. Pictured from left are affiliated sales associates Rick Greene, Laurel Peters, Executive Director Patricia Dowling, and Roy Monte. “We are committed to giving back to the community and are especially proud to support these worthy organizations which provide vital services to local residents. The resources and assistance they offer is essential for the health, well-being, security and stability of our neighbors,” said Jeanne Rutigliano, sales manager of the Coldwell Banker Residential Brokerage office in Essex. The Coldwell Banker Residential Brokerage Cares Foundation is supported by the affiliated sales associates and staff of Coldwell Banker Residential Brokerage. Through regular donations, fundraising events and volunteer support, Coldwell Banker Residential Brokerage’s affiliated sales associates and staff demonstrate their commitment to unity, hope and vision in the communities of Connecticut and Westchester County. Coldwell Banker Residential Brokerage Cares Foundation is a chapter of Realogy Charitable Foundation, a 501(C)(3) nonprofit organization incorporated in Delaware, tax ID 20-0755090. Coldwell Banker Residential Brokerage Cares Foundation’s primary purpose is to raise funds to provide financial assistance to housing-related causes in the communities where we have a presence. Coldwell Banker Residential Brokerage, a leading residential real estate brokerage company in Connecticut and Westchester County, N.Y., operates approximately 51 offices with more than 2,200 affiliated sales associates serving the communities of Connecticut and Westchester County, N.Y. Coldwell Banker Residential Brokerage is part of NRT LLC, the nation’s largest residential real estate brokerage company. For more information, visit ColdwellBankerHomes.com.